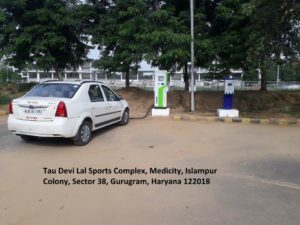 Upholding the Government’s mission of shifting 30 per cent of country’s fleet to electric mode by 2030, Chief Minister of Haryana, Manohar Lal Khattar flagged off electric vehicles and Exicom Tele-System Limited Alternating Current (AC) and Direct Current (DC) fast chargers and hands them to Gurugram Metropolitan Development Authority (GMDA) officials. As part of the initiative to develop electric vehicle charging points across the country, Exicom installed AC & DC electric vehicle charging station at Car Parking Facility of Tau Devi Lal Sports Stadium. With a commitment to realising the vision of making India a 100 per cent Electric Vehicles Nation, Exicom is all set for the requisite. Serving an experience of two decades in engineering, designing, and manufacturing efficient, reliable and cost-effective power and energy solutions for electric vehicles, telecom, information technology and renewable sectors, all its deployments are backed by state-of-the-art R&D centre, manufacturing setup and pan India service support. Exicom’s electric mobility ecosystem portfolio includes high voltage EV Chargers, Cloud-based Central Management System, highly reliable and robust electric vehicles AC and DC fast chargers with Bharat EV Chargers designed for 2 wheelers, 3 wheelers, passenger cars and commercial transport, On Board Chargers, DC-DC converter, and Motor Control Unit.